The analysis of arable lands’ fertility in the main agricultural territories of the Far Eastern Federal District. Th e peculiarities of its cultivated areas’ structure were also shown. It was recommended to increase the shares of perennial grasses in the crop rotations up to 25-30 %. It is possible to improve the effectiveness of forage production via new highly productive varieties of oats for forage, as well as winter rye, corn and other crops. Keywords: cultivated areas’ structure, soil fertility, perennial and annual grasses, land-improving plants, the Far Eastern Federal District. The effect of potassium humate and fertilizers on growth and development of multi-row barley as well as on its photosynthetic activity and productivity has been studied. It has been found that optimizing doses of mineral fertilizers in combination with potassium humate improves the elements of productivity, thus increasing the grain yield. Keywords: common barley, potassium humate, shoots’ density, grain weight from one spike, photosynthetic potential, productivity. The article presents the data on the productivity of Galega orientalis in single-species planting and mixtures with gramineous grasses. It is shown that single species crops of Galega orientalis and its mixture with Bromopsis inermis were the most effective on sod-podzolic sandy loam. Keywords: Galega orientalis, Bromopsis inermis, Phalaroides arundinaceae, Phleum pratense, Festuca pratensis, grass mixtures, crude protein yield. The features of the spatial and temporal dynamics of galega’s productivity within the agricultural landscape are studied. The regularities of the influence of agro-climatic and landscape conditions on the productivity of non-traditional fodder crop are shown. Keywords: landscape, oriental goat’s rue, productivity, groundwater level, agro-climatic parameters. The valuable properties of red fescue were studied in the river channel and the floodplain of the first terrace above the Lena River. Keywords: red fescue, productivity, forage quality. The article presents the results of studying the productivity of grain and grass crop rotation under increasing doses of nitrogen, phosphate and potash fertilizers and manure. Keywords: crop rotation, fertilizers, productivity, soil fertility. The article presents the results of studying the effect of calculated doses of fertilizers and plant density on yield quantity and quality of the early-maturing maize hybrids. It is found that stand density 100 thousand plants 1 ha-1 provides the programmed productivity when fertilized for a 20 t 1 ha-1 increment and yield of 40 t 1 ha-1. Enhancing the background of mineral nutrition improves the quality of maize green mass, and increases the gain of feed units per hectare. Keywords: maize, green mass, programming, productivity, quality, stand density, mineral nutrition grounds. Elk farm creation focuses primarily on the use of natural forage base. Adequate choice of lands with the necessary diversity of forage plants makes it possible to obtain dietetic, ecologically proper and functional production with some medicinal properties. Keywords: elks, domestication, forage bases, plants, bio-technical activities. 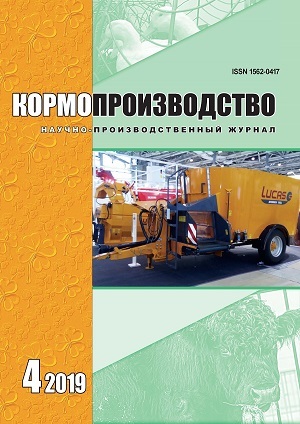 The article outlines the main directions for common vetch breeding, it shows the characteristics of the newly released varieties Lugovskaya 24 and Valentina. Keywords: common vetch, variety, productivity. The article presents the results of developing the agricultural methods of grain sorghum cultivation. Th e best methods were found for basic soil tillage and fertilizer use in Zakamye. Keywords: sorghum, soil tillage, fertilizer, productivity. The article presents the results of studying the productivity of forage crops in the rotations typical for the Kazakhstan steppe, and their economic evaluation. Keywords: forage crops, crop rotation, productivity. Characteristics of promising species of grassland plants recommended for environmental improvement of forage land, given the variety and technology of their seeds. Keywords: grassland grass, sort, technology, planting dates, methods and seed rates, productivity. The article describes the peculiarities of growth and root system formation of Salsola orientalis of different ages on the brown soils in arid conditions of the North-Western Caspian region. It is shown that Salsola orientalis forms a thick and deep root system reaching up to 3,6 m by the third year of life. The article presents the experience of using long-term cultivated grasslands on peat and cutover soils, that allows to preserve the sward’s productivity for more than 40 years. Keywords: peat bog, sown hayfields, mineral fertilizers, productivity. The article presents the program, technique and results of researches into technological methods of simplified improvement of natural fodder lands. It shows the results of field tests of the sod seeder STS-2.1 with effective working mechanisms. Keywords: fodder lands, technological methods of improvement, strip reseeding of grasses, legume/grass mixtures, sod and stubble seeders, power inputs, productivity of fodder lands, technological conditions and equipment parameters. The All-Russian Williams Fodder Research Institute has published a new collective monograph “Hayfields and pastures on drained lands of Non-Chernozem zone” under the general editorship of Doctor of Agricultural Sciences A. A. Zotov and V. M. Kosolapov. Th e book is meant for the agricultural staff , farmers and students. Keywords: hayfields, pastures, drained lands, fodder production, Non-Chernozem zone.